The first popular “arcade games” were early amusement park midway games such as Shooting galleries, ball toss games, and the earliest coin-operated machines, such as those which claim to tell a person their fortune or played mechanical music. The old midways of 1920s-era amusement parks (such as Coney Island in New York) provided the inspiration and atmosphere of later arcade games. In the 1930s, the earliest coin-operated pinball machines were made. These early amusement devices were distinct from their later electronic cousins in that they were made of wood, did not have plungers or lit-up bonus surfaces on the playing field, and used mechanical instead of electronic scoring readouts. By around 1977, most pinball machines in production switched to using solid state electronics for both operation and scoring. In 1971, students at Stanford University set up the Galaxy Game, a coin-operated version of the Spacewar computer game. This is the earliest known instance of a coin-operated video game. Later in the same year, Nolan Bushnell created the first mass-manufactured such game, Computer Space, for Nutting Associates. In 1972, Atari was formed by Nolan Bushnell and Ted Dabney. Atari essentially created the coin-operated video game industry with the game Pong, the smash hit electronic ping pong video game. Pong proved to be popular, but imitators helped keep Atari from dominating the fledging coin-operated video game market. Video game arcades sprang up in shopping malls, and small “corner arcades” appeared in restaurants, grocery stores, bars and movie theaters all over the United States and other countries during the late 1970s and early 1980s. Games such as Space Invaders (1978), Galaxian (1979), Pac-Man (1980), Battlezone (1980), and Donkey Kong (1981) were especially popular. During the late 70s and 80s, chains such as Chuck E. Cheese’s, Ground Round, Dave and Busters, and Gatti’s Pizza combined the traditional restaurant and/or bar environment with arcades. By the late-1980s, the arcade video game craze was beginning to fade due to the reputation of arcades as being seedy, unsafe places as well as the advances in home video game console technology. Arcade video games experienced a resurgence with the advent of two-player fighting games such as Street Fighter II (1991) by Capcom, Mortal Kombat (1992) by Midway Games, Fatal Fury (1992) by SNK, Killer Instinct (1994) by Rare, and The King of Fighters (1994-2005) by SNK. However by 1996, home video game consoles and computers with 3D accelerator cards had reached technological parity with arcade equipment—arcade games had always been based on commodity technology, but their advantage over previous generations of home system was in their ability to customize and use the latest graphics and sound chips, much as PC games of today do. Declines in arcade sales volume meant that this approach was no longer cost-effective. Furthermore, by the late 1990s and early 2000s, networked gaming via console and computers across the Internet had also appeared, replacing the venue of head to head competition and social atmosphere once provided solely by arcades. The arcades also lost their status as the forefront of new game releases. Given the choice between playing a game at an arcade three or four times (perhaps 15 minutes of play for a typical arcade game), and renting, at about the same price, the exact same game—for a video game console—the console was the clear winner. Fighting games were the most attractive feature for arcades, since they offered the prospect of face-to-face competition and tournaments, which correspondingly led players to practice more (and spend more money in the arcade), but they could not support the business all by themselves. Recent 20th anniversary arcade machine, combining two or more classic video games. To remain viable, arcades added other elements to compliment the video games such as redemption games, merchandisers, and food service. Referred to as “fun centers” or “family fun centers” , some of the longstanding chains such as Chuck E. Cheese and Gatti’s Pizza (“GattiTowns”) also changed to this format. Many old video game arcades have long since closed, and classic coin-operated games have become largely the province of dedicated hobbyists. Today’s arcades have found a niche in games that use special controllers largely inaccessible to home users. An alternative interpretation (one which includes fighting games, which continue to thrive and require no special controller) is that the arcade game is now a more socially-oriented hangout, with games that focus on an individual’s performance, rather than the game’s content, as the primary form of novelty. Examples of today’s popular genres are rhythm games such as Dance Dance Revolution (1998) and DrumMania (1999), and rail shooters such as Time Crisis (1995) and House of the Dead (1996). Virtually all modern arcade games (other than the very traditional midway-type games at county fairs) make extensive use of solid state electronics and integrated circuits. In the past coin-operated arcade video games generally used custom per-game hardware often with multiple CPUs, highly specialized sound and graphics chips and/or boards, and the latest in computer graphics display technology. 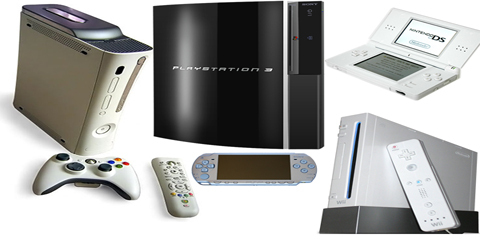 Recent arcade game hardware is often based on modified video game console hardware or high end PC components. Sometimes, arcade games are controllable via more immersing and realistic means than either PC or console games, and feature specialized ambiance or control accessories, including fully enclosed dynamic cabinets with force feedback controls, dedicated lightguns, rear-projection displays, reproductions of car or plane cockpits and even motorcycle or horse-shaped controllers, or even highly dedicated controllers such as dancing mats and fishing rods. These accessories are usually what set modern arcade games apart from PC or console games, as they are usually too bulky, expensive and specialized to be used with typical home PCs and consoles. Games on consoles or PCs can be referred to as “arcade games” if they share these qualities or are direct ports of arcade titles. Many independent developers are now producing games in the arcade genre that are designed specifically for use on the Internet. These games are usually designed with Flash/Java/DHTML and run directly in web-browsers. Arcade flight games also use simplified physics and controls in comparison to flight simulators. These are meant to have an easy learning curve, in order to preserve their action component. Increasing numbers of console flight arcade games, from Crimson Skies to Secret Weapons Over Normandy indicate the falling of manual-heavy flight sim popularity in favor of instant arcade flight action.